It is observed with vigils, marches, and other forms of public education on or around October 2, honoring in that way—the great Mahatma Gandhi who dedicated his life to ahimsa (the Sanskrit word for nonviolence, and selfless, unconditional love). He was the originator of the technique of Satyagraha which literally means holding unto truth. Gandhi considered it love in action. Satya or the truth to him was the awareness that all life is one. He taught that when there is no more violence left in the human heart, all that remains is our true essence which is love. 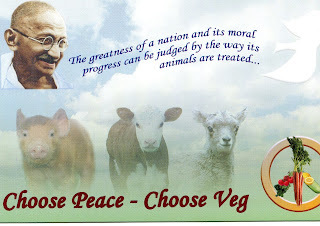 Why would Gandhi have loved WFAD? Because he wanted to make sure everyone remembered his birthday? Well, probably not. One of his great goals was to become a “zero.” This did not mean to him that he was worthless but rather that he would become able to be selfless in all his actions. No—I think Gandhi would have loved WFAD because it is carrying on the practice of love in action so dear to his heart. 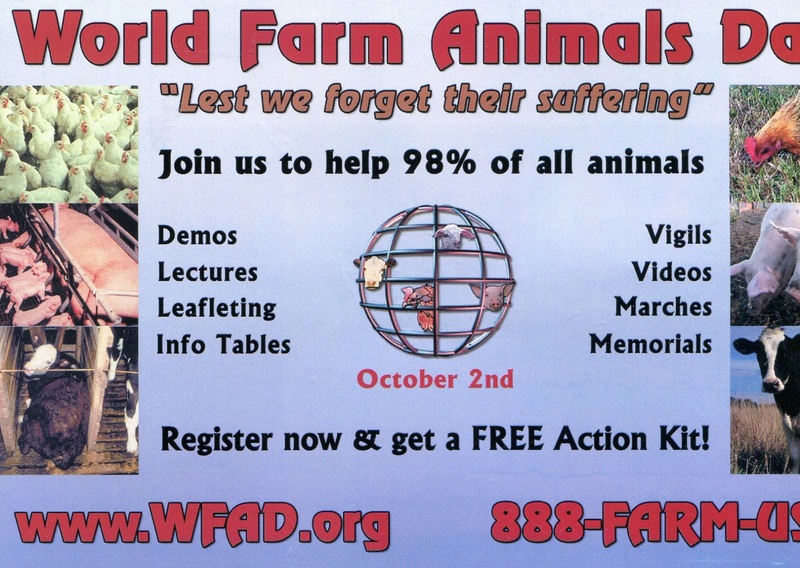 Why would Gandhi have loved WFAD? Diligently he prayed for someone to emerge, “some great spirit, man or woman, fired with divine pity, who will deliver us from this heinous sin [of killing animals], [and] save the lives of the innocent creatures…” WFAD is one of the many beautiful satyagrahas, consisting of millions of people with enough love in their hearts and in their actions to do just what he prayed for. We have emerged. We are here. And we’re not giving up. On this very special day and time, may we fall silent in mourning and honor the memory of the billions of animals who suffer and die each year at the hands of human beings. As they die in the slaughterhouses, no prayers are said, no names are given.. So today is their day for tears to be shed for them, candles to be lit, flowers to be scattered, and prayers be said for them. May this terrible war on animals end, and may all beings be free. Thanks be to you all for bearing witness, for caring, and for your selfless love. P.S. 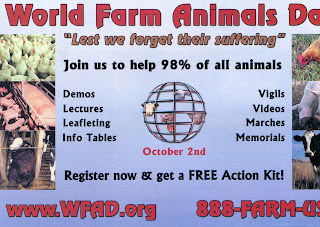 The post cards above are available at FARM's website so that you can distribute them and raise consciousness for the animals who need our voices so desperately. Thank you, Judy, for the lovely tribute to Gandhi, to FARM, and to the divine qualities of truth, justice and compassion that inspire all social movements and individual actions that are founded on Love.